The human skull forms the foundation of our head and protects our brain. The skull may look like it is one solid bone but it actually has many bones that articulate together with unique types of joints. There are eight cranial bones and fourteen additional bones that make up our skull for a total of twenty-two. The cranium is the part of the skull that forms the majority of our head and is composed of eight bones. 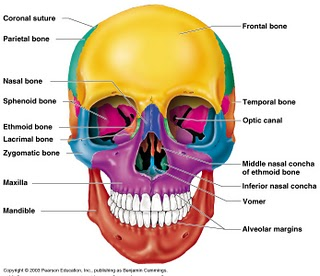 This includes the frontal bone, a parietal bone on each side, a temporal bone on each side, the occipital bone, the ethmoid bone, and the sphenoid bone. These bones articulate with each other via unique joints called sutures, which almost completely disables any movement at all. There are fourteen bones that form our faces. These bones help to form the structure for our nose, cheeks, mouth, and jaw. The nose is composed of some relatively small bones. There are two nasal bones (one on each side), two nasal conchae (one on each side), and the vomer. The vomer is part of the nasal septum and articulates with the sphenoid and ethmoid bones of the cranium. There are also two lacrimal bones; these are technically bones that also help to form the structure of the nose but they are also important structures to protect the lacrimal glands, which produce tears. The cheeks are formed by two zygomatic bones; these are the cheek bones. Sometimes they are referred to as zygomatic arches. 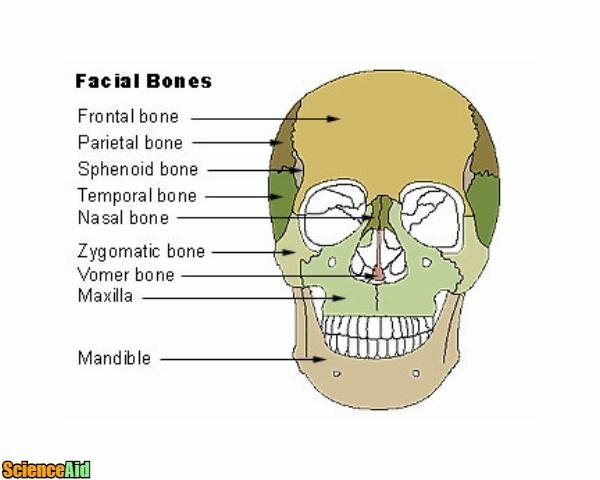 The zygomatic bones articulate with the maxilla, temporal, frontal, and sphenoid bones on each side of the face. The mouth and jaw are formed by two palatine bones, two maxilla bones, and the mandible. The two palatine bones form the roof of the mouth and help to form the mouth cavity. The two maxilla bones (one on the left and one on the right) form the top jaw and provides an anchor to our upper teeth. The mandible forms the bottom jaw and anchors our bottom teeth; the mandible forms a hinge joint with the temporal bones called the temporomandibular joints (or TMJ; one on the left and one on the right). The TMJ can often become disordered and cause pain, trouble eating, and lockjaw among other symptoms. Disordered TMJs sometimes require surgery to replace the joint kind of like a knee or hip joint replacement. 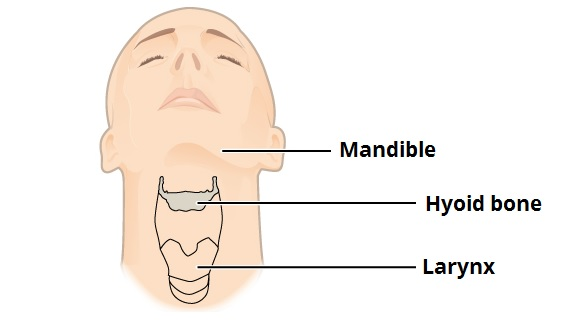 The hyoid bone helps to give us a chin and jawline but is rarely considered to be part of the facial bones, probably because it is located in the neck. It is a unique bone because it does not directly articulate with any other bones and instead actually floats within the musculature of the neck. An interesting fact about the hyoid bone is that in forensic analysis, a fractured hyoid can often indicate that a person was strangled. It is also often clinically implicated in obstructive sleep apnea. The three smallest bones in the body are the bones of the middle ear that help perpetuate sound to the inner ear. These are not considered part of the skull bones, but given the importance of these bones to the skull, they will be outlined. 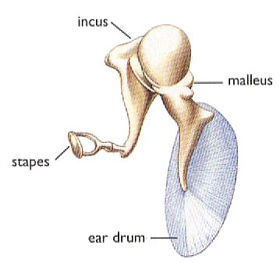 The three bones of the inner ear are called the malleus (also sometimes known as the hammer), incus (sometimes known as the anvil), and stapes (sometimes known as the stirrup). The stapes is the smallest of the bones, making it the smallest bone in the entire human body. The alternative names given to these bones are closely linked to the appearance or function of the specific bone. Sound enters the ear and causes the tympanic membrane (eardrum) to vibrate against the malleus or "hammer", which vibrates onto (or hits) the incus or "anvil", which carries the vibrations to the stapes and then to the inner ear where it is processed further. Teeth are bones but are not included in the number of bones in our skull even though they are embedded in the maxilla and mandible bones. 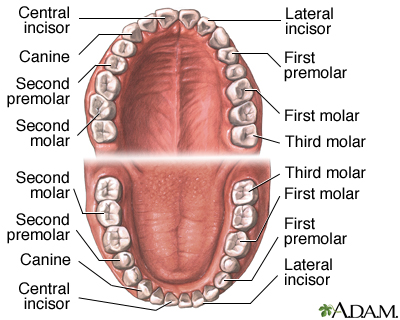 As children, we have 20 deciduous teeth that will fall out to give way to permanent teeth; 10 on the top in our maxilla and 10 on the bottom in our mandible. Adults have 16 teeth on the top row and 16 on the bottom row for a total of 32 adult teeth. This includes wisdom teeth, which are actually called third molars and are often removed surgically around the age of 16 or 17 because they can often create misalignment of the existing teeth. MLA (Modern Language Association) "Bones of the Human Skull." 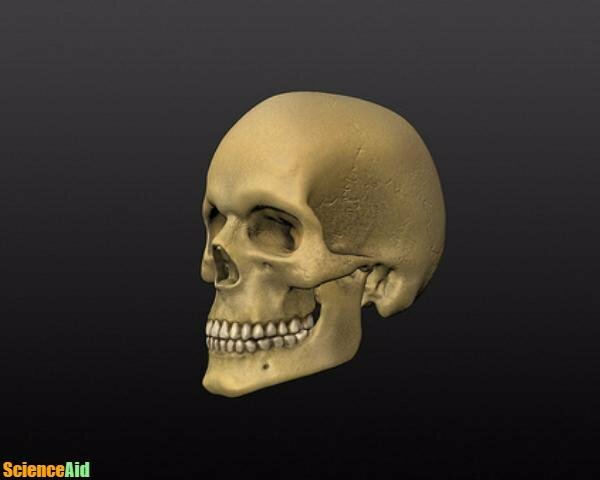 ScienceAid, scienceaid.net/Bones_of_the_Human_Skull Accessed 23 Apr 2019. Chicago / Turabian ScienceAid.net. "Bones of the Human Skull." Accessed Apr 23, 2019. https://scienceaid.net/Bones_of_the_Human_Skull. Thanks to all authors for creating a page that has been read 9,149 times.